When we were over in Seattle the week before and including Thanksgiving, one of the things we did was pack up and move my mother-in-law’s things to her new retirement home in Ballard. 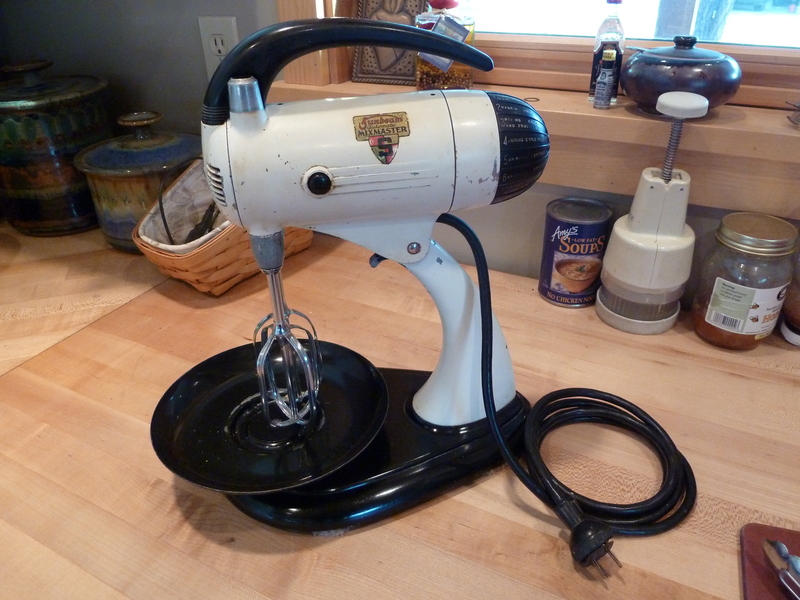 This involved quite a bit of “down-sizing”, and one of things I came home with was her Sunbeam Mixmaster, which she had held on to for all these years. 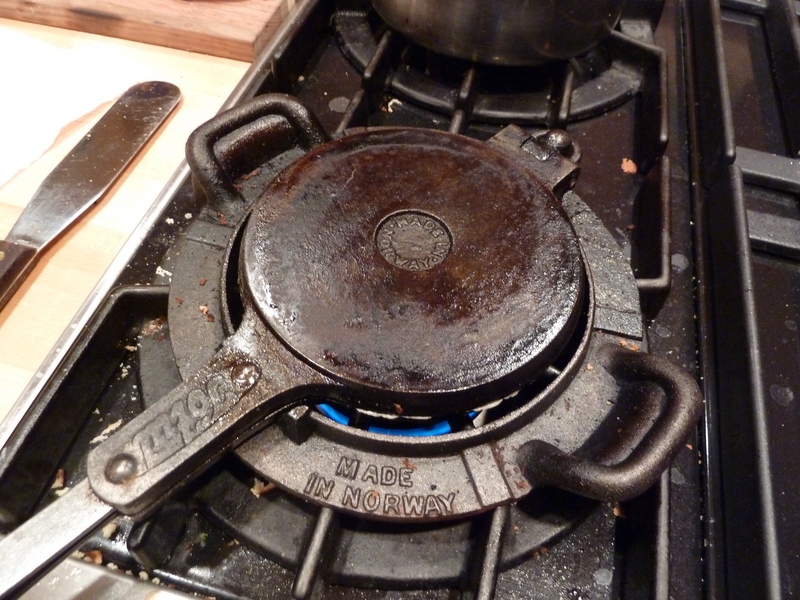 It worked, but had no bowls, although the beaters were in pretty good shape. 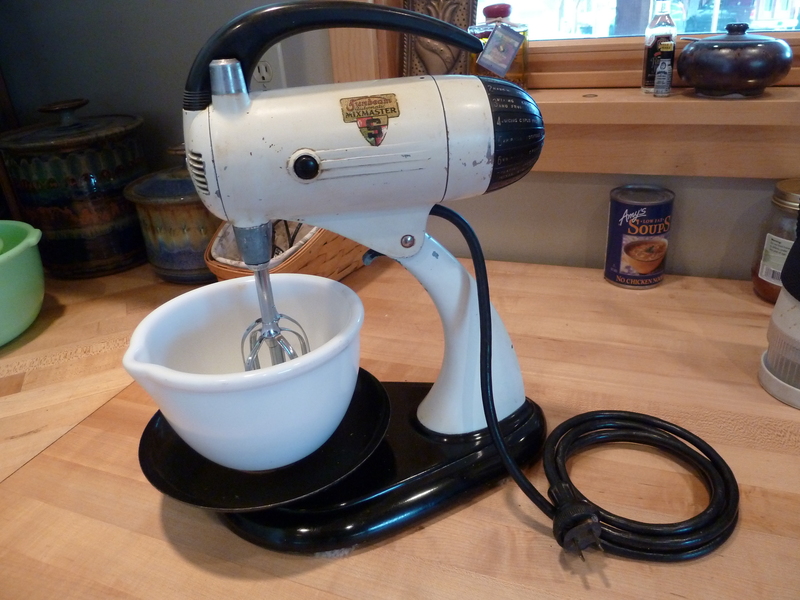 You can remove the mixer from its stand and use it as a hand mixer, so maybe that is what she had in mind. So on the way home, Rick wanted to stop at the antique malls in Cashmere (near Wenatchee). He half-jokingly said “maybe we can find a bowl for the Mixmaster” (what he is really looking for is woodworking hand tools). Hmm, sez I, not a bad idea! I asked the ladies at the first place if they knew if they had such a thing – it is such a big sprawling place I didn’t want to seach it high and low. They actually knew their inventory and brought me several choices! 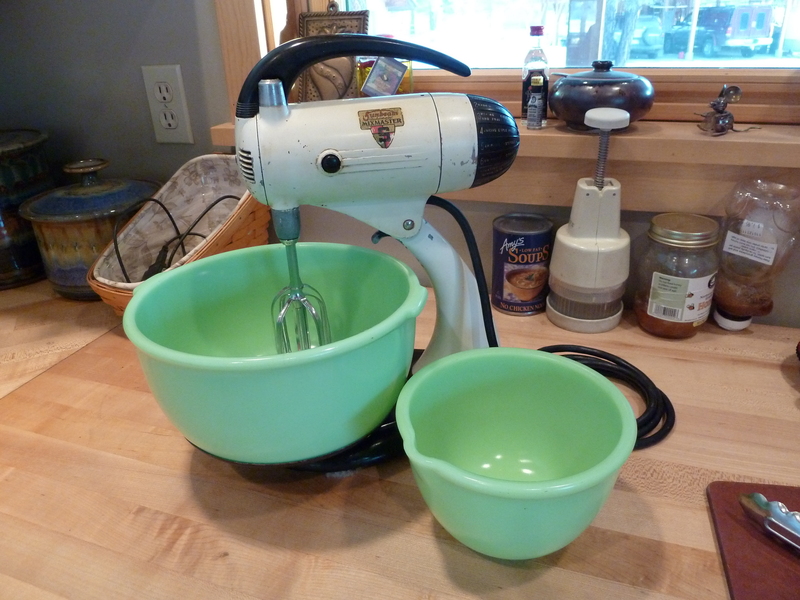 Only one fit the base of our mixer, and it is the small bowl, but for 6 bucks at least I had something that would make it usable…. Then we went across the highway to the other antique mall, equally big and sprawling. I found a lot of candidates but none that fit my mixer (notice it is now MY mixer). I really wanted the big bowl, too. Then I found these two beauties hiding on the floor in one of the booths…. Everyone I have shown this to has said “My mom had one exactly like that! !” So did ours! I am ridiculously pleased with this thing and will leave it out on the counter and use it. 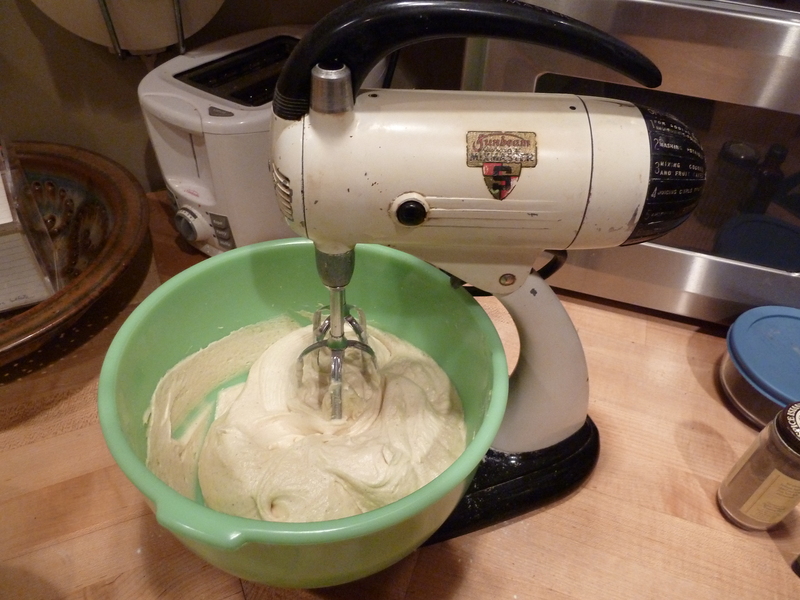 It’s not like I don’t have a Kitchenaid (my mom’s actually – thanks Dad!) and that one will always be the workhorse mixer. But I just love the Mixmaster. 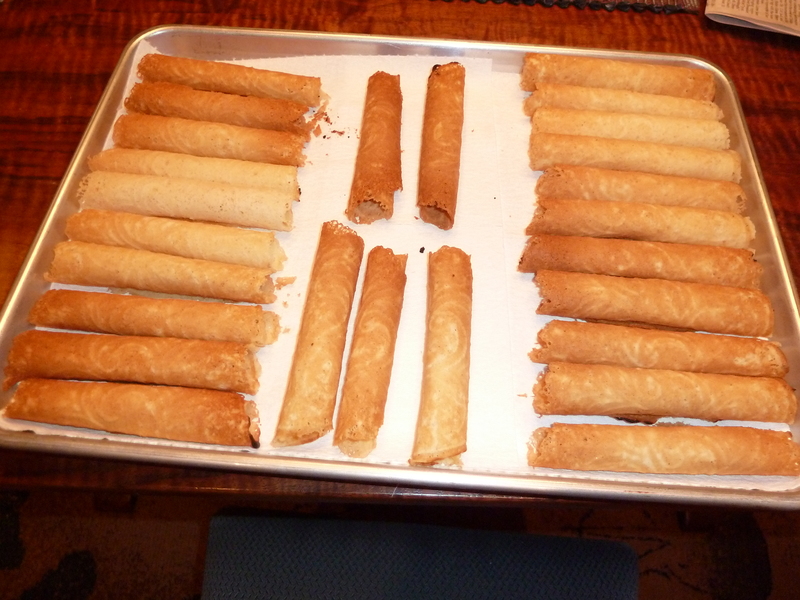 I have since found some information online about Sunbeam Mixmasters. This one is a model 7 and they were manufactured starting in 1941, with a hiatus in production during World War II, up until about 1948. It had the largest production of all the Sunbeams, with over 3 million made. Like previous models it came as 7A in cream with jadeite bowls, or as 7B in black and white with white bowls. We’re off to Seattle again this weekend, for various reasons, but the driving should be easy since it remains dry and cold up here in the Northwest. It’s been clear and cold here, with no change in sight for next week. We still have snow but it is getting to be an icy, crusty affair. It’s beautiful – but we’re getting anxious about lack of new snow for skiing and snowshoeing! 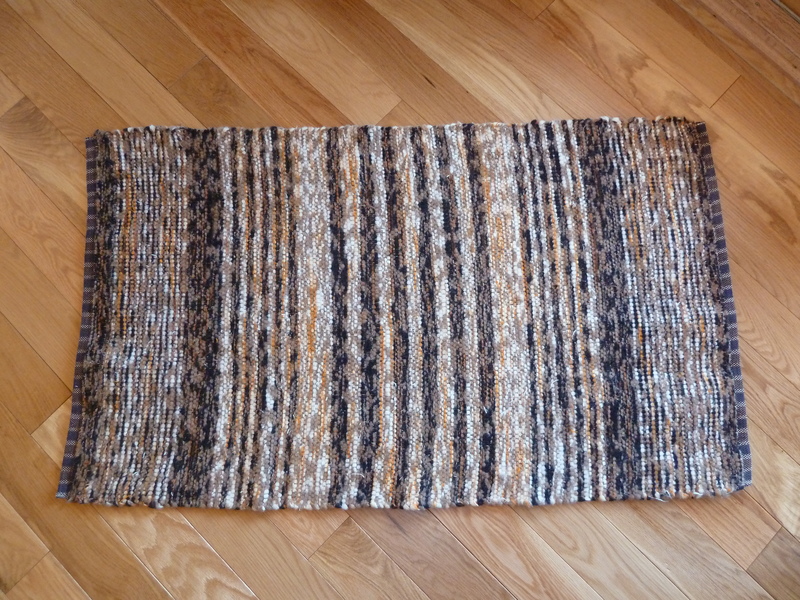 Meanwhile, since returning from Seattle at Thanksgiving, I finished up 3 rugs. 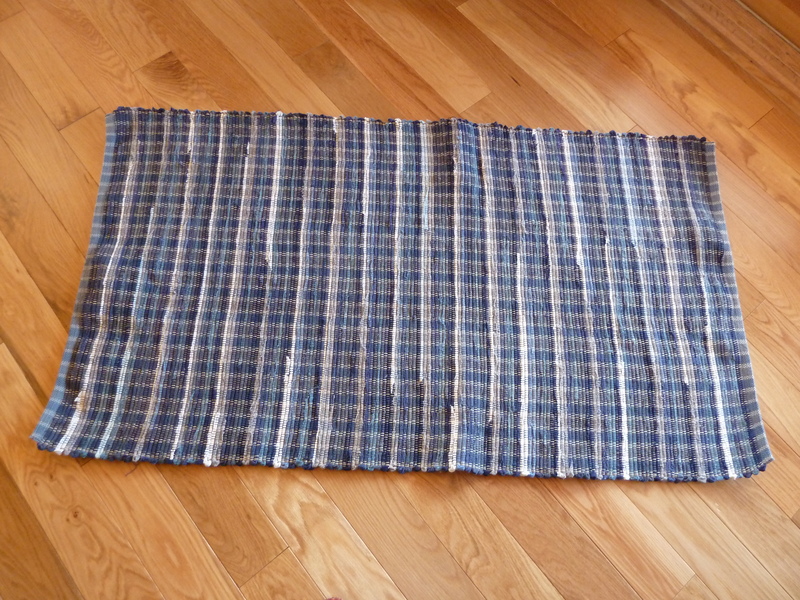 The first two shown below were done with Pendleton “worms”, a selvage edge trimmed from the sides of the Pendleton blankets as they are being woven (they later bind the edges with a wool cloth edging). 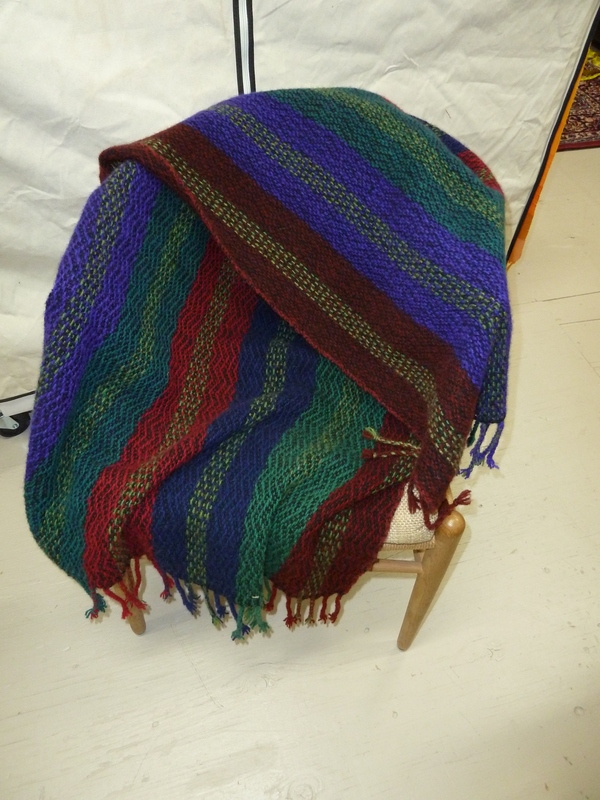 I have bags and bags of this stuff in a variety of colors, and this time around with the rug warp I think I will concentrate on using it and playing with the colors. By the way, I have had several comments from friends/family that I never showed pictures of our new oak floor after it was installed in October. 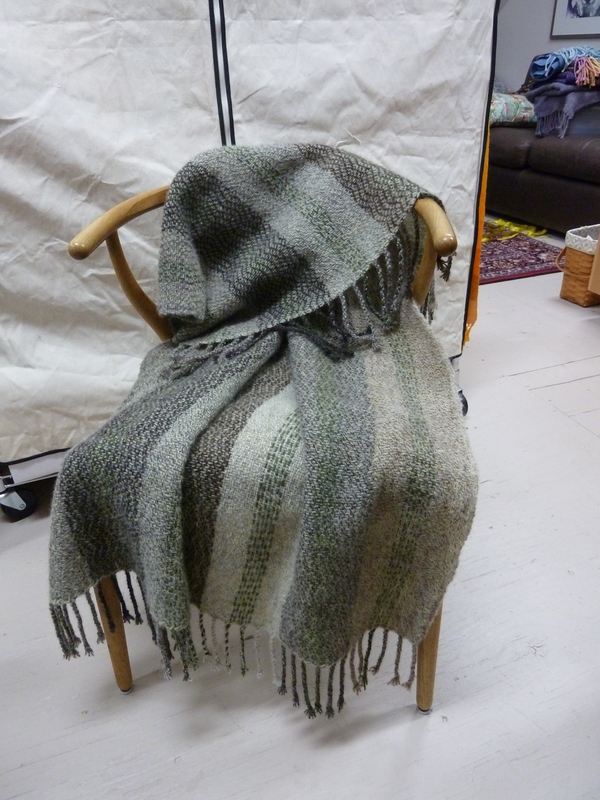 So folks – THAT’S IT in the background of the rug photos below! The next one was done with 9 colors of cotton corduroys and some lightweight denims. 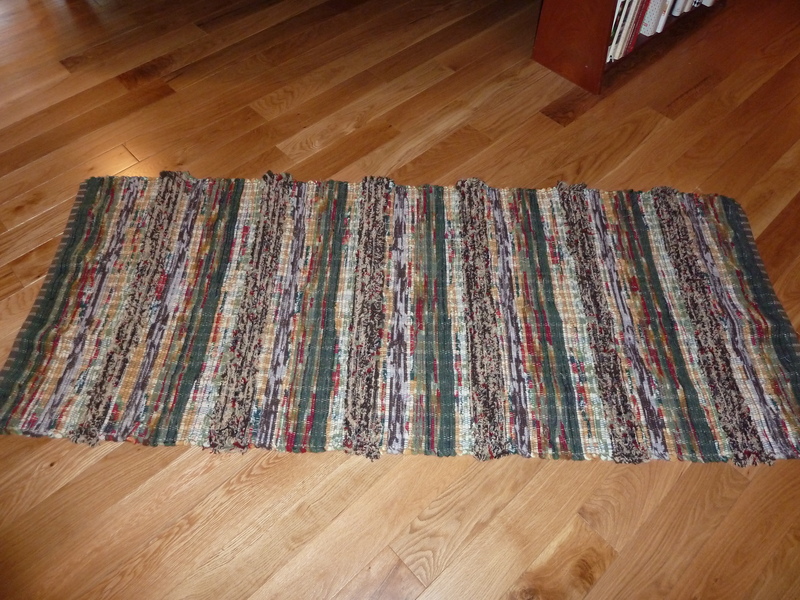 I sequenced the 9 colors by sewing the ends of strips together at the sewing machine – most of the strips were only about 20″ long – and there are 20 repeats of the 9-color sequence in the rug. 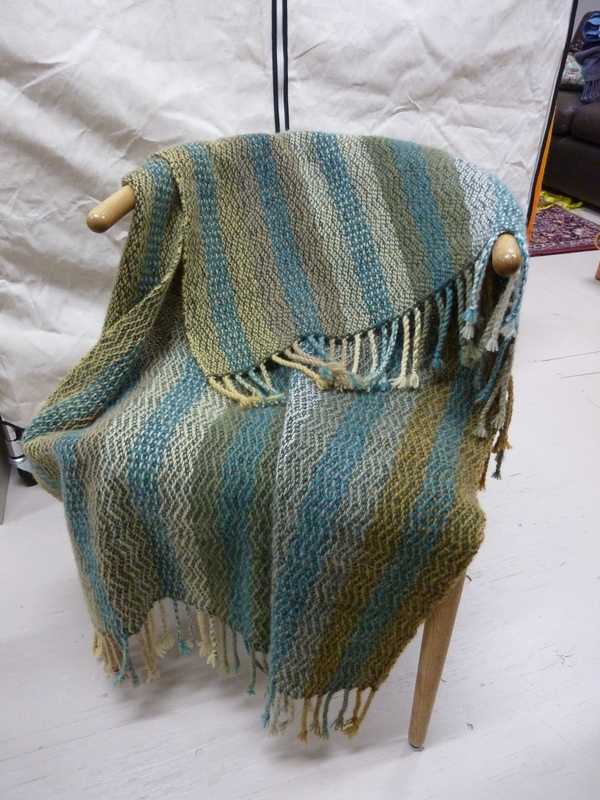 A lot of work preparing the strips for weaving, but I like the effect. 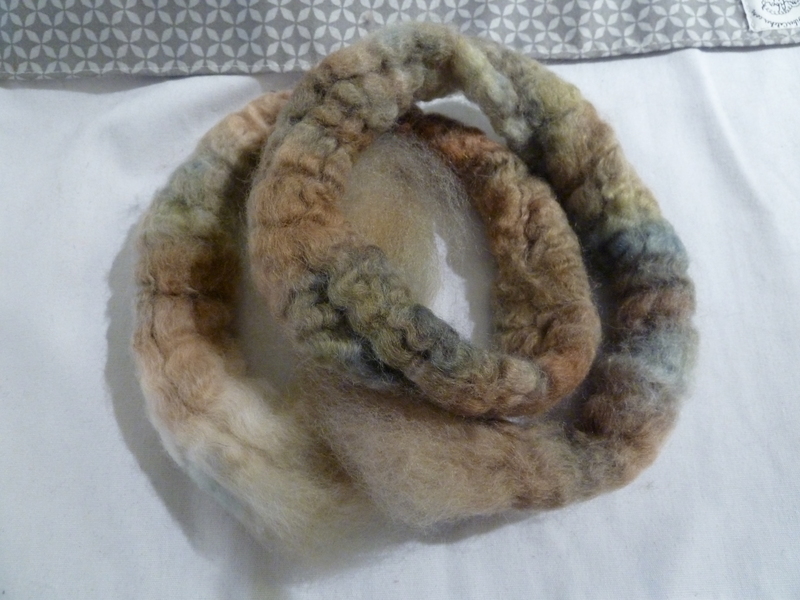 I’ve also been spinning some beautiful dyed Blue-Faced Leicester top that I bought from Briar Rose Fibers at the first Sock Summit in Portland, OR. 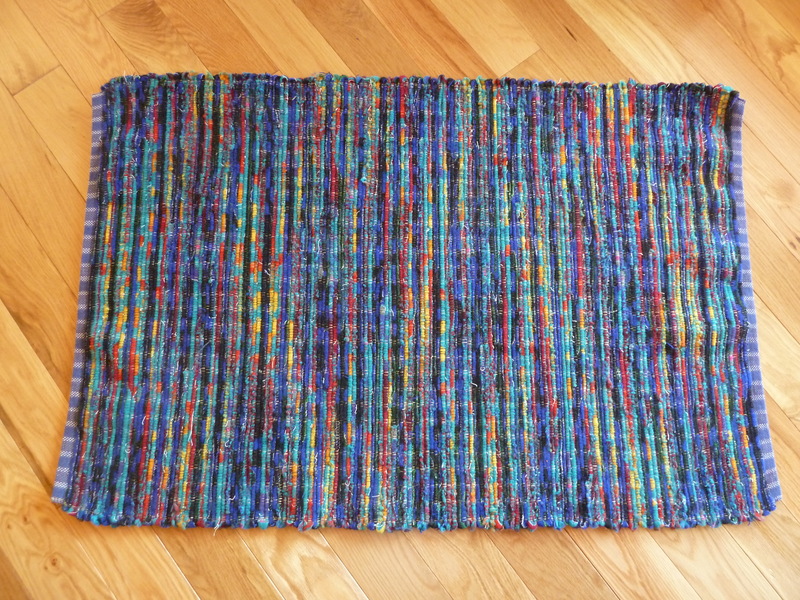 I started this project in Seattle on my HansenCraft minispinner, and I am planning to make a 3-ply yarn which I hope will be enough to knit something for myself. 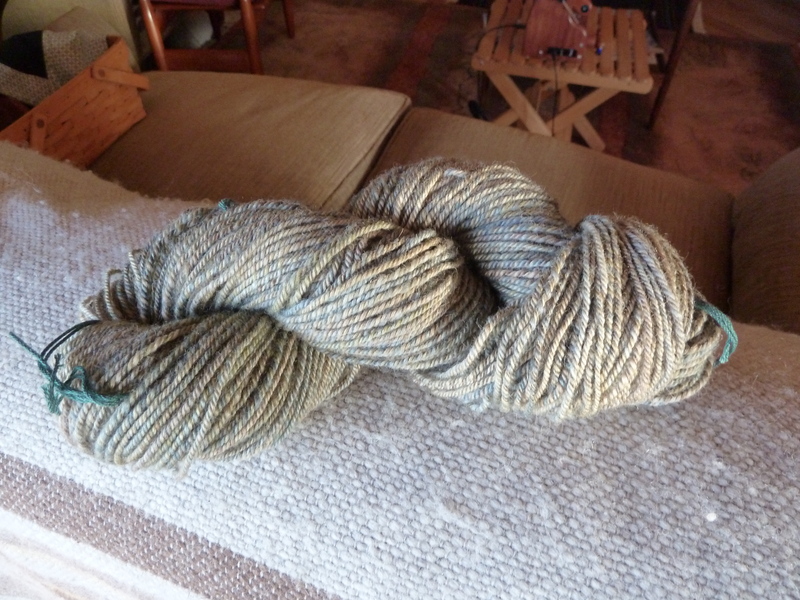 Actually I have finished all the spinning at this point and should be able to get it plied up this week. 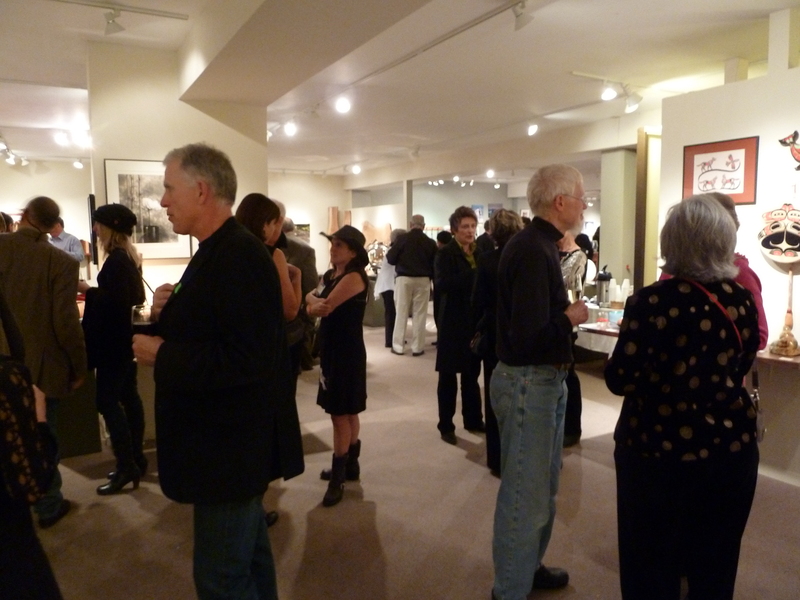 Last night we went down to the Confluence Gallery in Twisp for an evening event called “Black Tie Methow Style.” They had fabulous hors d’oeuvres, champagne and a no-host bar. People got dressed up – but with bit of a twist in many cases. 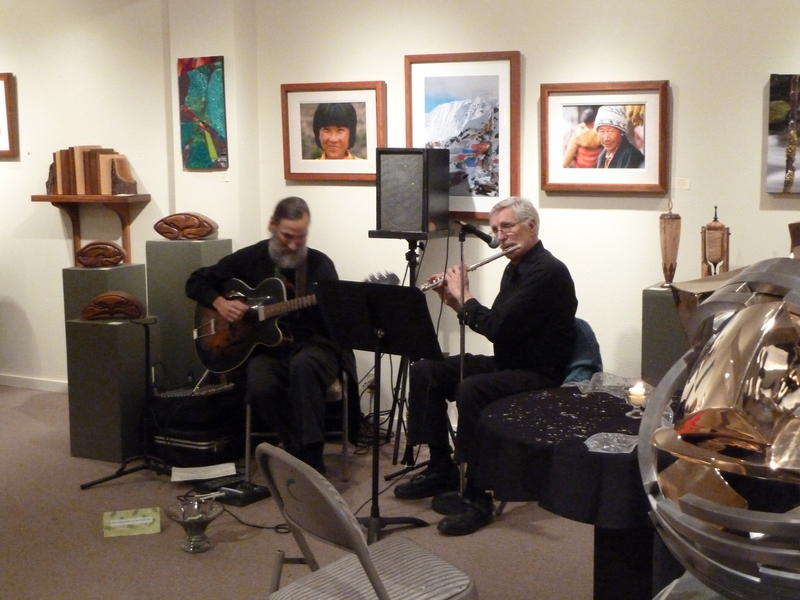 Two of our favorite local musicians were playing jazz. I didn’t get the best of pictures, but it was a lot of fun and we got to see and socialize with many friends we hadn’t seen for a while. A nice kick-off to the holiday season! 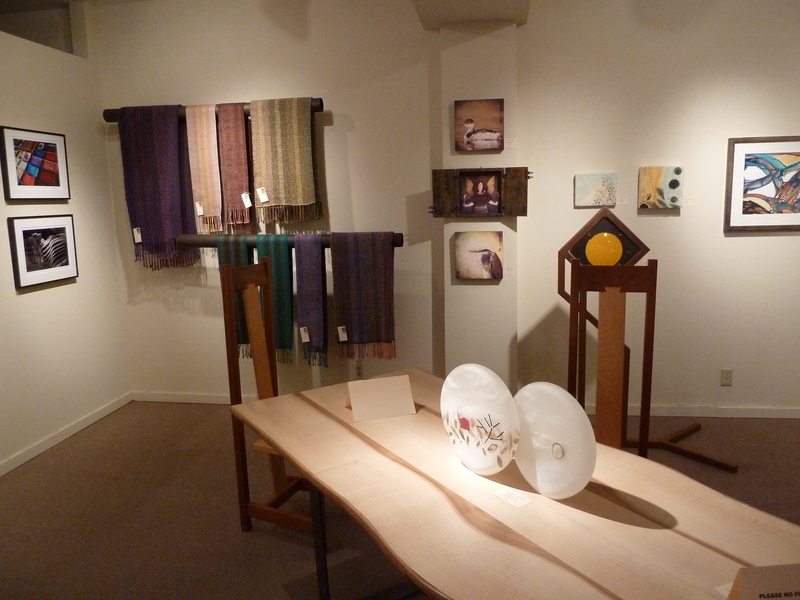 There’s a new show up at the Confluence Gallery in Twisp titled “Exquisite Craft.” Rick and I both have some work in this show and there are many really wonderful things. 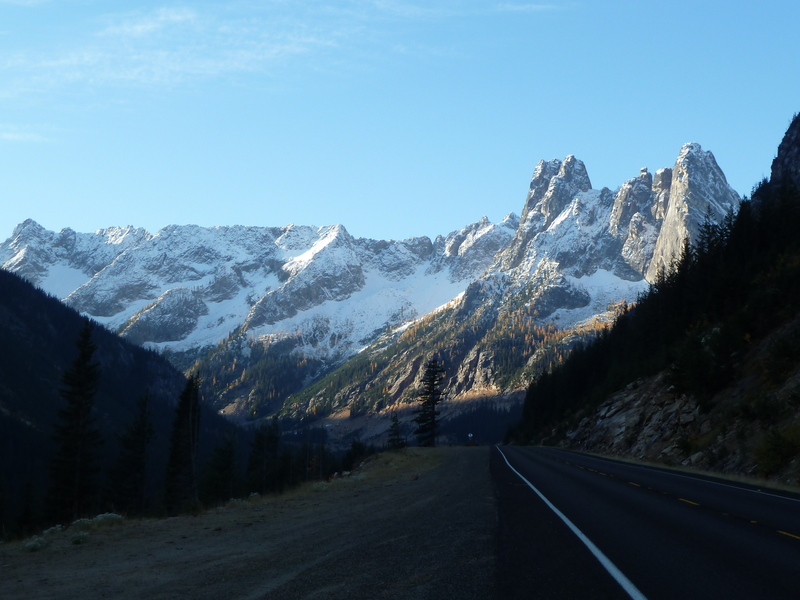 Anyone in or passing through the valley between now and early January, make sure to get off the highway (Twisp’s main street is one block east) and spend a little time there. 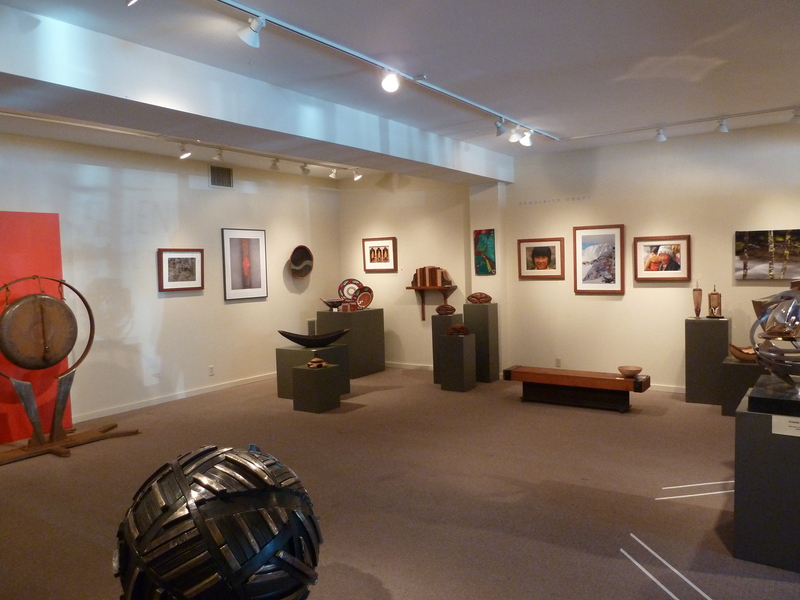 The Winthrop Gallery also mounted their Holiday Gift Show this week, but I am sorry to say I have no pictures. 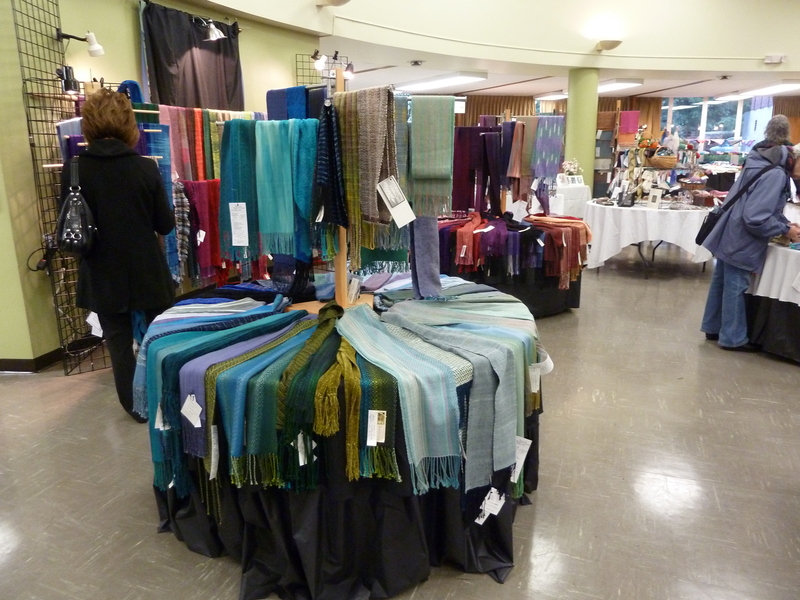 Looks pretty good though and there are a lot of nice hand-made items. 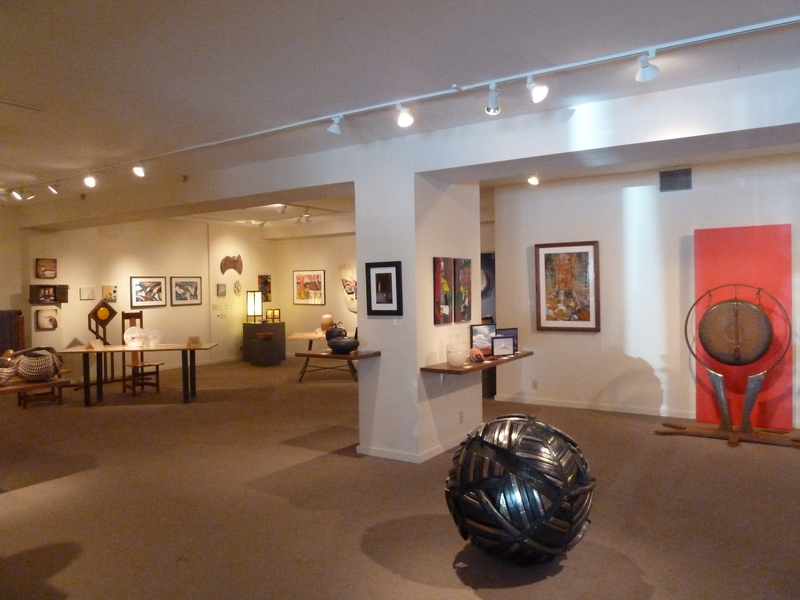 This is an artist cooperative gallery in Winthrop of which I am now a member. 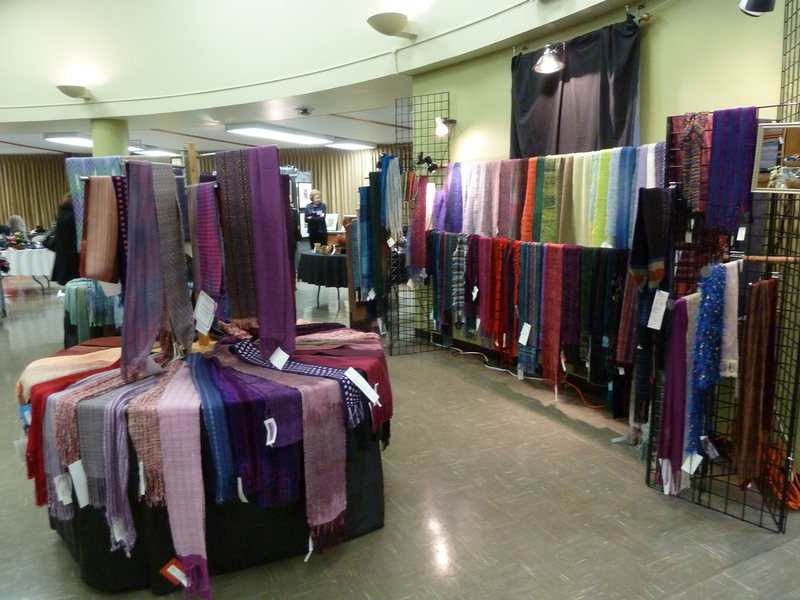 And this weekend saw the Methow Valley Spinners & Weavers Guild annual show and sale. 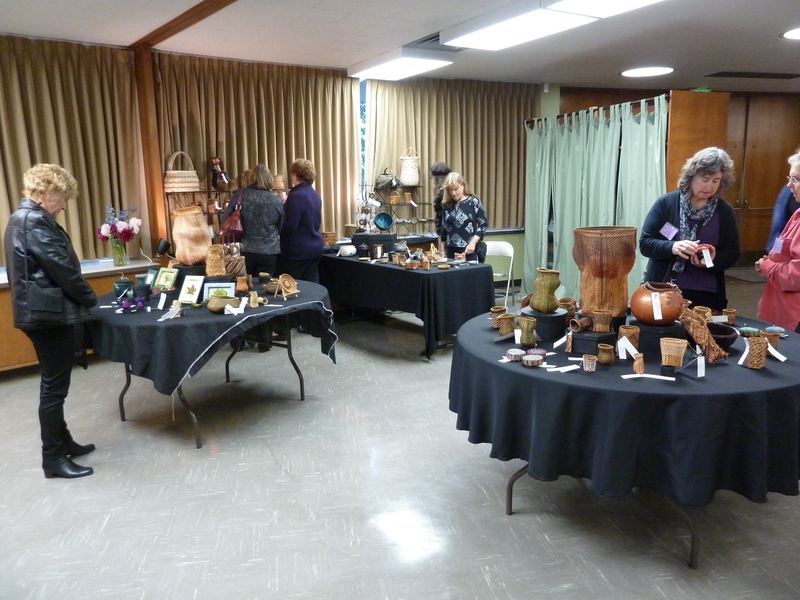 I didn’t get by there until the end of the day today, as I was teaching a knitting class down in Chelan, but it looks like a lot of people came by to see the work of our guild, and many of them also purchased holiday gifts. So thank-you to all those folks! We’re off early tomorrow morning for a week on the Coast so no blogging for me until we return after Thanksgiving…. I haven’t been taking too many pictures lately, and blogging without pictures seems kind of lame. But it isn’t like I haven’t been busy! I am teaching the Topdown Set-In Sleeve Sweater class again (I taught it for the first time in the fall) – 2 groups, one on Thursday nights here at my home, and the other on Saturday mornings down at Uptown Woolery in Chelan. I set it up as a 5-week series, although we are taking a break over Thanksgiving week. With her permission, I am basing it on Karen Alfke’s Unpattern, although in the course of teaching it the first time, I came up with an alternate approach to planning and knitting the set-in sleeve cap. 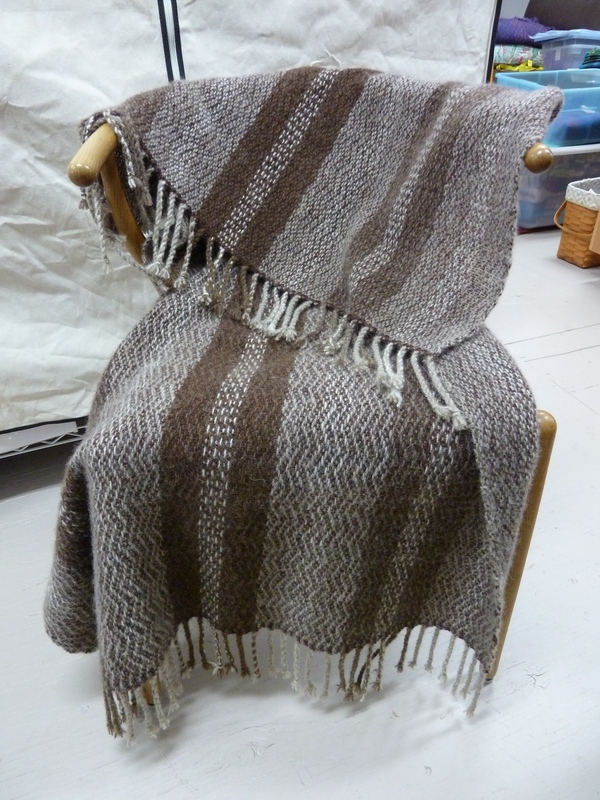 By the way, these are knit in one piece from the top down – NO SEWING. I love that. 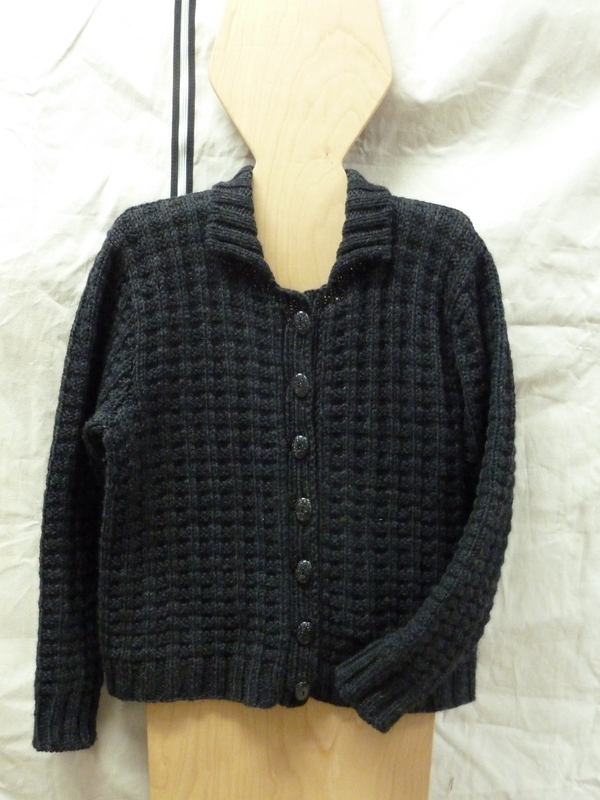 Here’s a sweater I knit along with my first class – I used 8 skeins of Grignasco “Alaska” which I bought from a friend at a stash reduction sale several years ago. 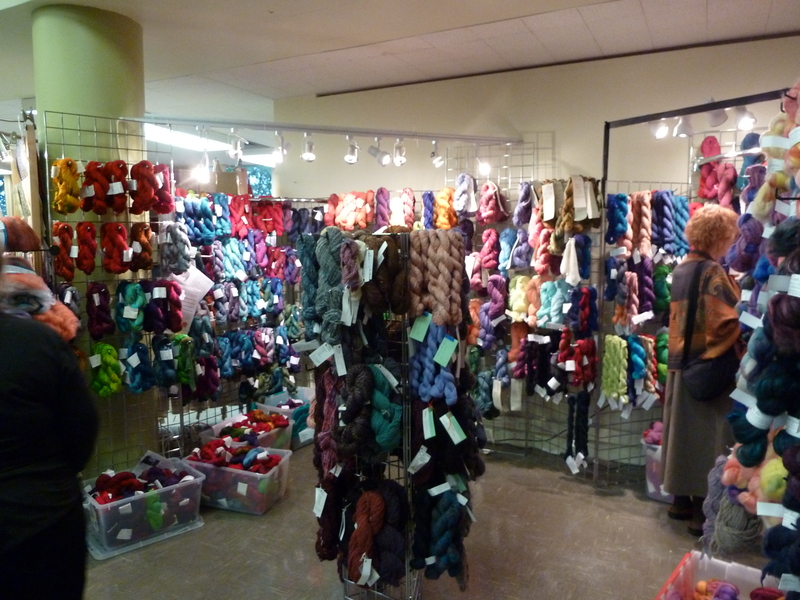 It is a long discontinued yarn, so there was no chance of getting any more, and it was a close-run thing. 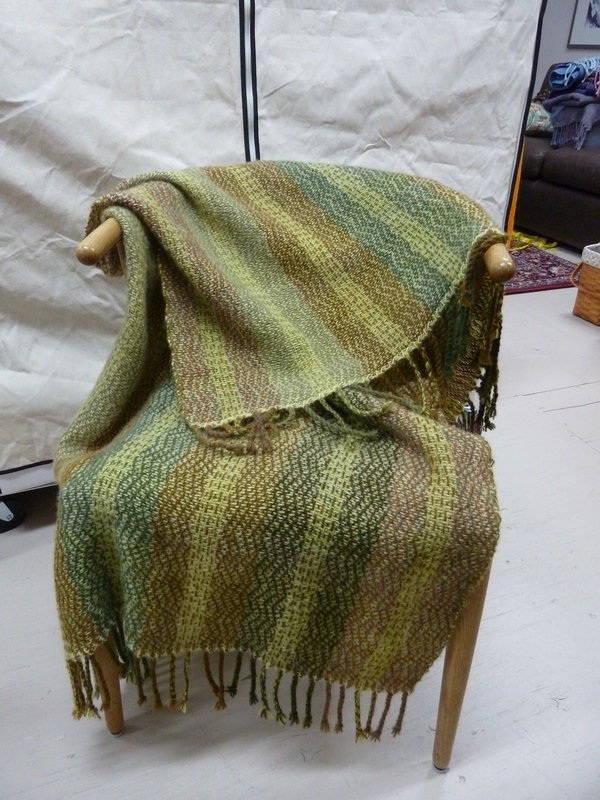 I had about 18″ (yes, inches) of yarn left when I was done! Top-down Set-in Sleeve Sweater in Grignasco "Alaska"
I think Wilma would have liked it – she was fond of “short and boxy” sweaters! And by the way, that is MY sleeve cap, not the Unpattern one. 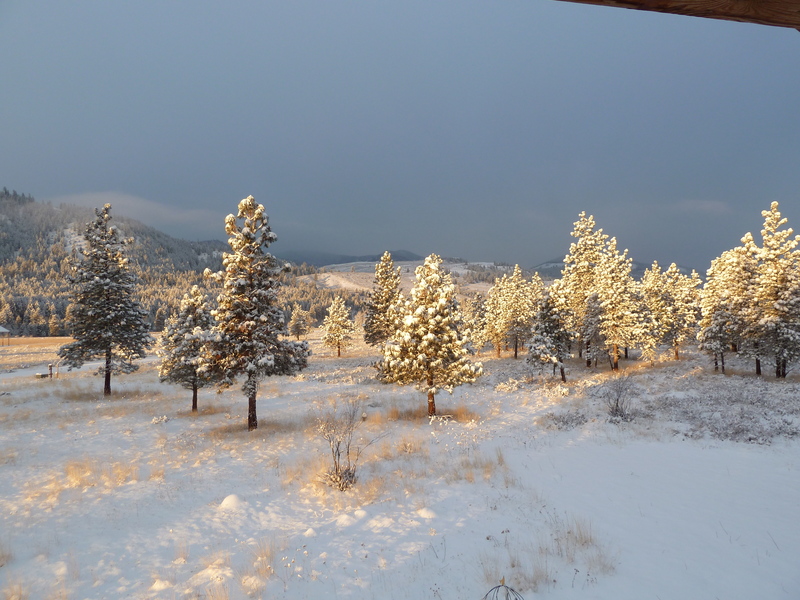 We had a little bit of snow yesterday, and it was beautiful this morning when the sun first came up. 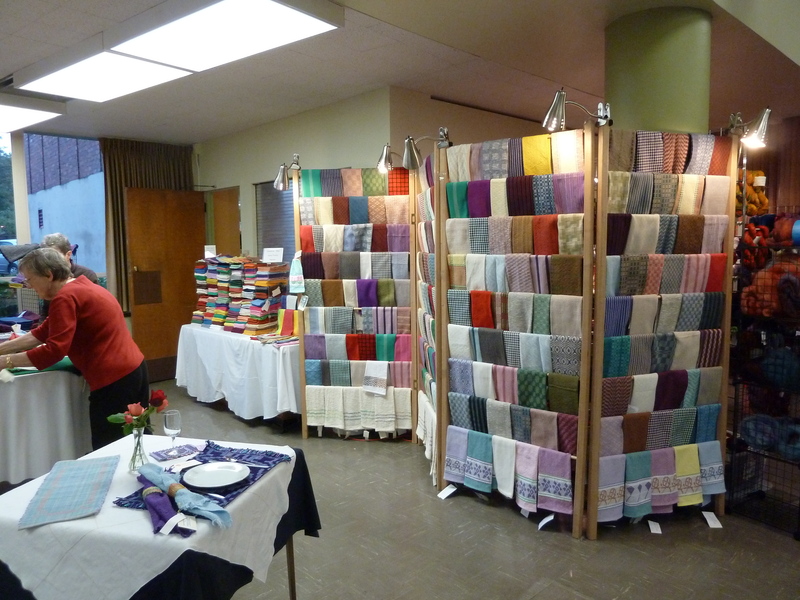 It was quite inspiring to see so much excellent work at the Seattle Weavers’ Guild sale. 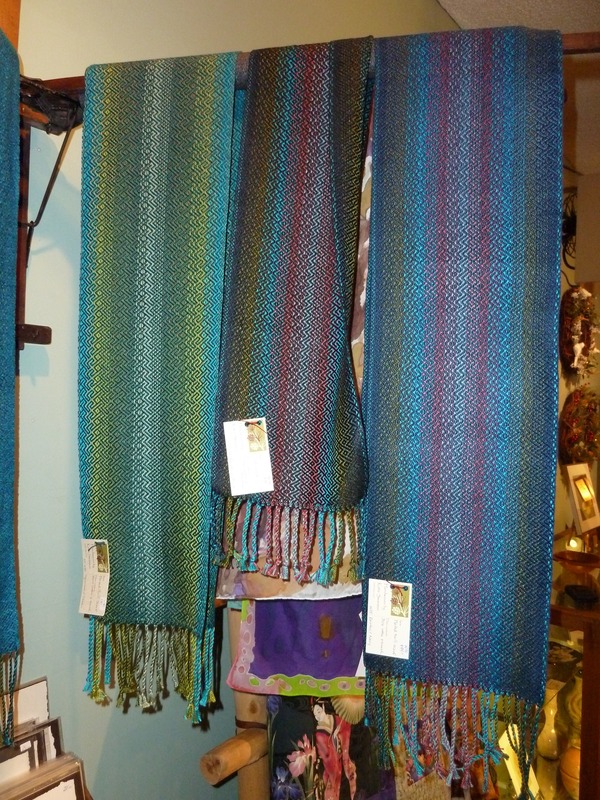 My head is swimming with new ideas – and, I came home with a few of my fellow weavers’ items as well. 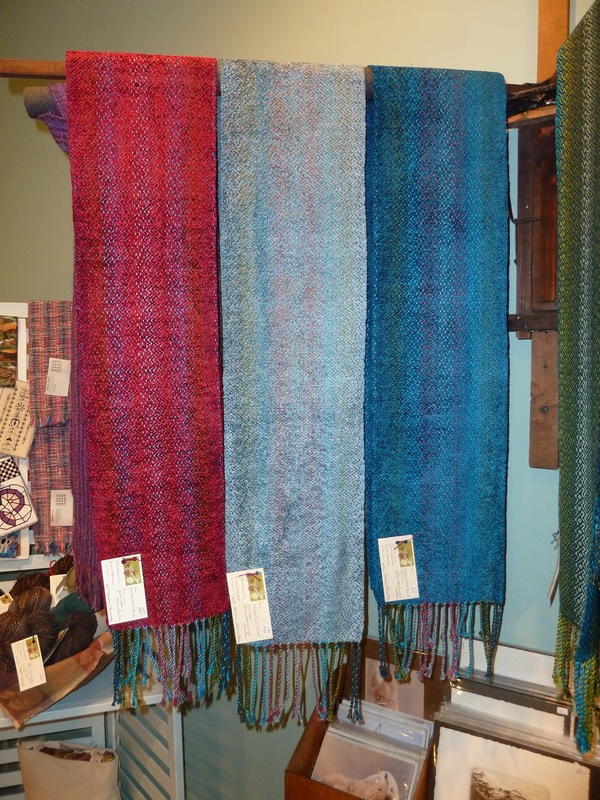 I sold four of my “peerie blankets” and two of the plaited twill scarves, and am quite pleased. 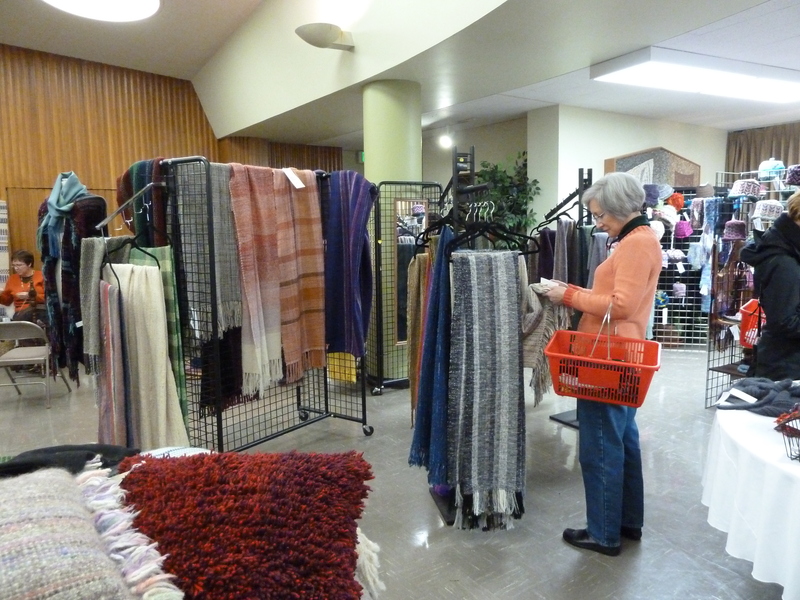 Not sure yet exactly which items sold, because we left for home on Saturday before the sale was over. A friend picked up my work on Saturday evening and is bringing it to me this week when we meet up in Port Townsend. Speaking of which, I need to go pack…..
We are dashing out the door for Seattle. 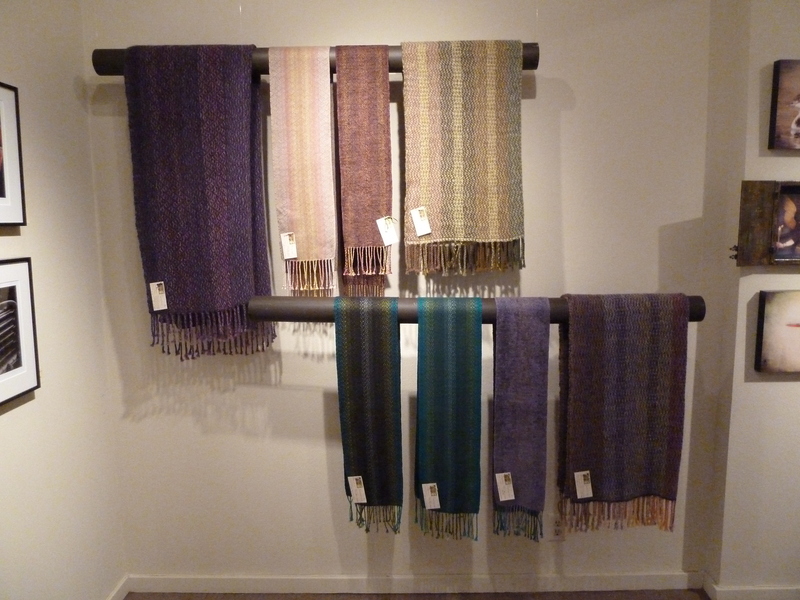 I have 13 scarves, 10 lap robes/throws (“peerie blankets”) and 2 wallhangings for the Seattle Weavers’ Guild show that runs Oct 27-29 at St Marks Cathedral on Capital Hill in Seattle (see sidebar for more info). Unbelievable amount of work getting them all finished, inventoried and labeled! 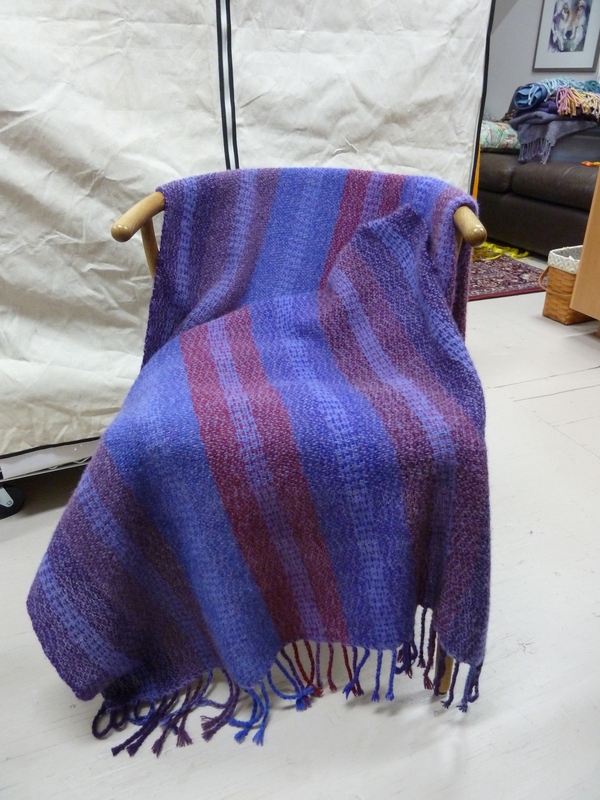 Purples - last one off the loom!